25 Jan 2019 – European Union policies contribute to a cycle of extreme abuse against migrants in Libya, Human Rights Watch said in a report released today [21 January 2019]. The EU and Italy’s support for the Libyan Coast Guard contributes significantly to the interception of migrants and asylum seekers and their subsequent detention in arbitrary, abusive detention in Libya. 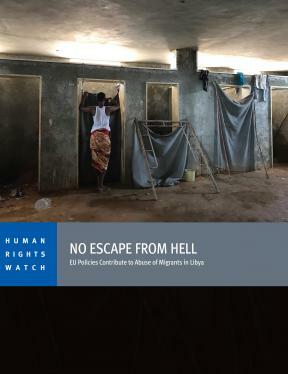 The 70-page report, “‘No Escape from Hell’: EU Policies Contribute to Abuse of Migrants in Libya,” documents severe overcrowding, unsanitary conditions, malnutrition, and lack of adequate health care. 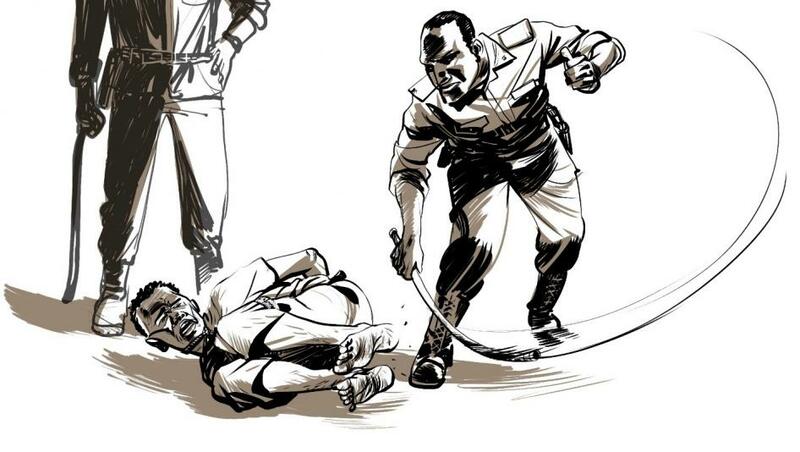 Human Rights Watch found violent abuse by guards in four official detention centers in western Libya, including beatings and whippings. Human Rights Watch witnessed large numbers of children, including newborns, detained in grossly unsuitable conditions in three out of the four detention centers. Almost 20 percent of those who reached Europe by sea from Libya in 2018 were children. “Migrants and asylum seekers detained in Libya, including children, are trapped in a nightmare, and what EU governments are doing perpetuates detention instead of getting people out of these abusive conditions,” said Judith Sunderland, associate Europe director at Human Rights Watch. In a letter to Human Rights Watch as the report went to print, the European Commission indicated that its dialogue with Libyan authorities has focused on respect for the human rights of migrants and refugees, that the EU’s engagement in Libya is of a humanitarian nature, and that concrete improvements have been achieved though challenges remain. 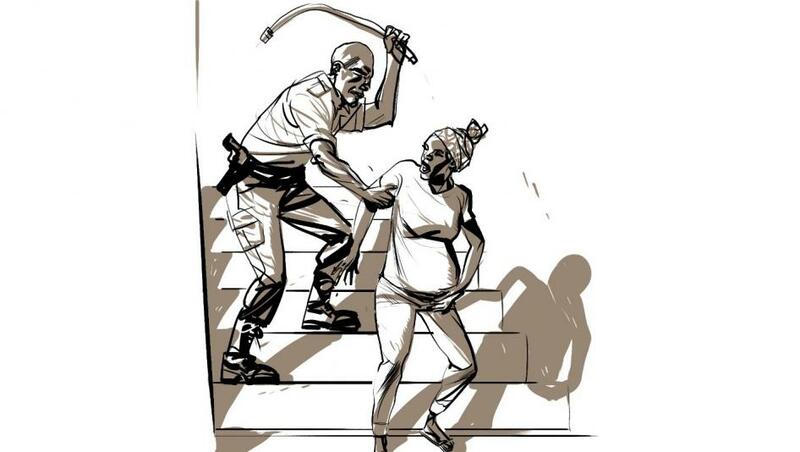 Kemi, a Nigerian woman who was seven-months’ pregnant at the time, said a guard at al-Karareem detention center beat her with a hose. 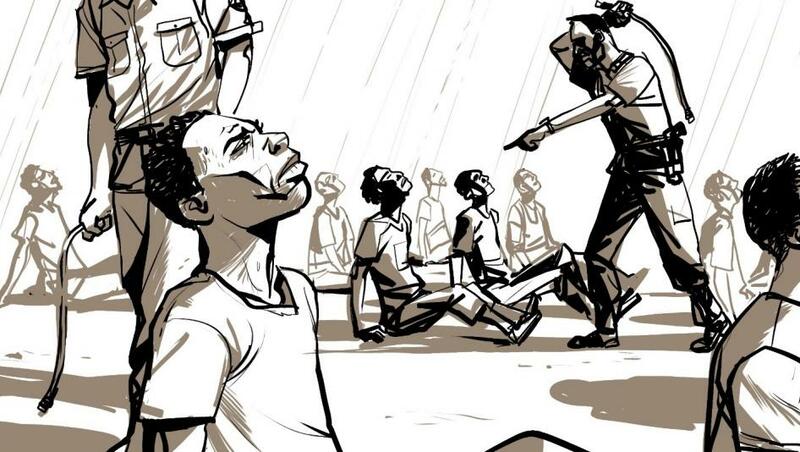 Human Rights Watch visited the Ain Zara and Tajoura detention centers in Tripoli, the al-Karareem detention center in Misrata, and the Zuwara detention center in the city of the same name in July 2018. All are under the nominal control of the Directorate to Counter Illegal Migration (DCIM) of the Government of National Accord (GNA), one of two competing authorities in Libya. Human Rights Watch spoke with over 100 detained migrants and asylum seekers, including 8 unaccompanied children, and each center’s director and senior staff. Researchers also met with the head of DCIM; senior officials of Libya’s Coast Guard, which is aligned with the GNA; and representatives of international organizations and diplomats. Abdul, an 18-year-old from Darfur, was intercepted by the Libyan Coast Guard in May 2018, when he attempted to reach Europe to apply for asylum. He was subsequently detained in abysmal, overcrowded, and unsanitary conditions in the al-Karareem center. He said that guards beat him on the bottom of his feet with a hose to make him confess to helping three men escape. Abdul’s experience encapsulates the struggle, dashed hopes, and suffering of so many migrants and asylum seekers in Libya today, Human Rights Watch said. Yet since 2016, the EU and particular member states have poured millions of euros into programs to beef up the Libyan Coast Guard’s capacity to intercept boats leaving Libya, fully aware that everyone is then automatically detained in indefinite, arbitrary detention without judicial review. Italy – the EU country where the majority of migrants departing Libya have arrived – has taken the lead in providing material and technical assistance to the Libyan Coast Guard forces and abdicated virtually all responsibility for coordinating rescue operations at sea, to limit the number of people arriving on its shores. The increase in interceptions in international waters by the Libyan Coast Guard, combined with obstruction by Italy and Malta of rescue vessels operated by nongovernmental organizations, has contributed to overcrowding and deteriorating conditions in Libyan detention centers. Human Rights Watch said. EU and member state support for programs for humanitarian assistance to detained migrants and asylum seekers and for evacuation and repatriation schemes have done little to address the systemic problems with immigration detention in Libya, and serve to cover up the injustice of the EU containment policy. Elijah said guards forced detainees to sit on the ground and stare at the sun. Libyan authorities should end arbitrary immigration detention and institute alternatives to detention, improve conditions in detention centers, and ensure accountability for state and non-state actors who violate the rights of migrants and asylum seekers. The authorities should also sign a memorandum of understanding with UNHCR, the United Nations refugee agency, to allow it to register anyone in need of international protection, regardless of nationality, in full respect of its mandate. EU institutions and member states should impose clear benchmarks for improvements in the treatment of migrants and conditions in detention centers in Libya and be prepared to suspend cooperation if benchmarks are not met. The EU should also ensure and enable robust search-and-rescue operations in the central Mediterranean, including by nongovernmental groups, and significantly increase resettlement of asylum seekers and vulnerable migrants out of Libya. “EU leaders know how bad things are in Libya, but continue to provide political and material support to prop up a rotten system,” Sunderland said. The New EU Copyright Law Closes the Book on Free Speech Online. That’s a Feature, Not a Bug.